Ha! That is just the tip of the iceberg to be honest. 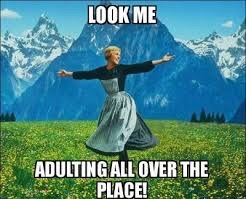 Adulting is no joke. I feel like i’m still that little girl that spent ages trying to get into the swing of learing how to ride my bike. It took me a while to learn how to ride my bike when I was younger and, i just didn’t get the hang of it as quickly as i’d like to have. But I got there eventually. This analogy may not entirely apply as such but it’s a similar feeling. I’m at what you might call the “early stages” of adulthood and obviously this is going to be a good ride but a long one, but i’m still trying to find my footing. And it wasn’t until recently as i was having a conversation about mortgages with my boyfriend that i realised, all the aunties that say “You’re still young” are simply lying. I’m pretty sure that’s not even the entire list and I am more than likely doing poorly in some areas but still learning nontheless. Adulting looks like who can multi-task the best and strike that balance. Although I’m always writing, I recently found myself caught up with other things, hence the absence of posts. But if you were to ask me what “other things” I’ve been caught up with – I couldn’t tell you! However, this is the beauty of a process, the beauty of becoming, creating, and crafting the life I want for myself. So, even though adult life may prove challenging, We tend to find our footing and I know i’ll find my mine and my rhythm like I did when I learned to ride my bike for the first time without falling.